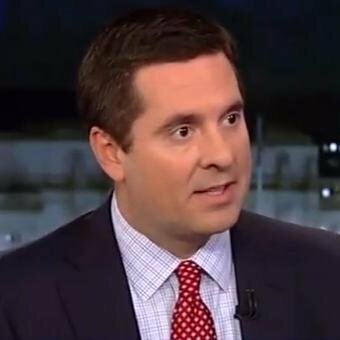 House Intelligence Committee Chairman Devin Nunes threatened late Tuesday to "impeach" FBI Director Christopher Wray and Deputy Attorney General Rod Rosenstein if they fail to turn over the document that in 2016 launched the FBI's probe of Russian contacts with the Trump campaign. "We're not going to just hold in contempt, we will have a plan to hold in contempt and impeach," Nunes said on Fox News. Nunes is furious with the agencies over attempts to obtain the two-page document the FBI used to initiate its probe of the Trump campaign's Russia contacts. That document, which the New York Times reported on in December, revealed that the probe was launched over an intelligence tip that George Papadopoulos, a campaign foreign policy aide, had revealed to an Australian diplomat that Russia had obtained dirt on Hillary Clinton. The revelation undercut claims that the investigation had been launched as a result of a disputed dossier compiled by British spy Christopher Steele, whose work was funded indirectly by the Clinton campaign and has been rejected by Trump as a fiction. President Donald Trump and the House Intelligence Committee later confirmed the Russia probe began at the FBI because of Papadopoulos when they released a formerly classified memo in February. But Nunes says the FBI has refused to turn over an unredacted version of the Papadopoulos document, despite a subpoena and demands stretching back to August. He set a new deadline for Wednesday and said he told Fox's Laura Ingraham that the decision on contempt and impeachment would depend on whether Wray and Rosenstein met the new deadline. A move to impeach two top officials at the Justice Department -- both appointed by President Donald Trump and confirmed by the Senate -- would be an extraordinary confrontation between Congress and federal law enforcement. You can read the full article at the below link.